Steph's Snack Shack: Eat your veggies! Every other Friday or so, my cousin and I get together with our men and have game night. Before we start the games we always cook dinner. Normally, it's fried fish and french fries, but my cousin's fiance wanted to eat a little healthier so i decided to look for a roasted veggie for a side dish. Sooo, I went to the trustworthy foodnetwork.com and found a great recipe. I went and read the reviews and saw that someone posted a few alternatives to the recipe and i tried it and loved it!! Below is the original, with my alterations. In a large bowl, toss the parsnips, carrots, potatoes and turnips, in 1 tablespoon of the olive oil, plus a little salt and pepper, until coated. 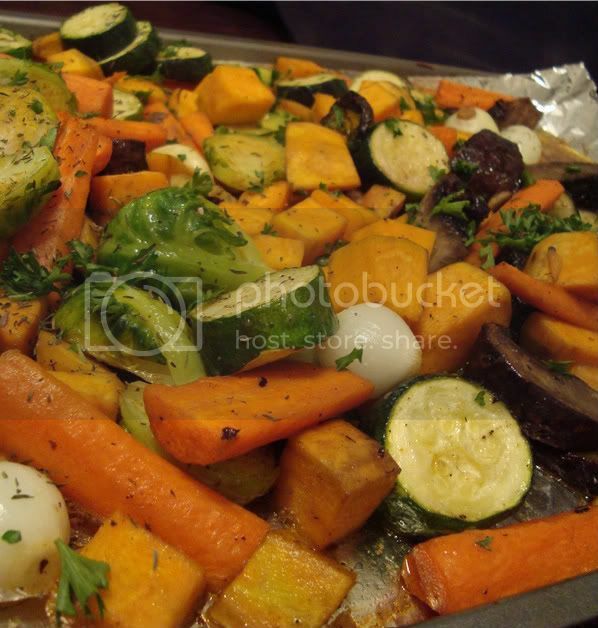 Arrange the vegetables cut-side down on a large baking sheet and roast on the bottom shelf of the oven for 20 minutes or until the vegetables are beginning to brown. Turn the vegetables 2 or 3 times during cooking to prevent burning. In the same bowl, toss the pearl onions, garlic and portobello mushroom with 1 tablespoon of olive oil, plus a little salt and pepper, until coated. Add this mixture to the baking sheet of vegetables and gently stir to combine. Continue roasting for 7 to10 minutes. Meanwhile, bring a small saucepan of salted water to boil and blanch the Brussels sprouts for 1 to 2 minutes. Drain thoroughly under cold running water. Set aside separately. In a small bowl, combine the shiitake mushrooms and the Brussels sprouts and toss with 1 tablespoon of olive oil, plus a little salt and pepper, until coated. Add them to the baking sheet of vegetables, stirring to combine. Dot the butter over the vegetables and sprinkle with 1/4 cup wine. Roast for another 7 to 10 minutes. Remove the vegetables from the oven and gently mix them with the thyme and parsley before serving. Delicious!!!!! I could eat it every day. The mushrooms were my favorite part. This looks fabulous! Thanks, Steph! Any leftovers that you could bring into work?? ?